When teaching English in a foreign country, you find yourself teaching about your own culture. Learning a language isn’t simply enough, you must be aware of the culture that comes with it. The translation of Easter in French is Paques. Later, I discovered in Spanish it is Pascua, Italian: Pasqua. The similarity is normal as these are all Romance languages based on Latin. But in Dutch, Russian, Danish, Cornish, Welsh, Greek, and even Hebrew, it is similar in form. What happened in English and other Germanic languages? Why do we say Easter? In Germany, before the rise of Christianity, there were many pagan Gods and Goddesses who were tied to nature. Many people are already familiar with the story that the Christmas Tree was adopted by the Christian Church because Germans did not want to part with the pagan tradition of having an evergreen in their home during the winter solstice. So they put a star on it, representing the star that led the Kings to Jesus, and claimed the Tannenbaum for Jesus. A similar thing happened with Easter. 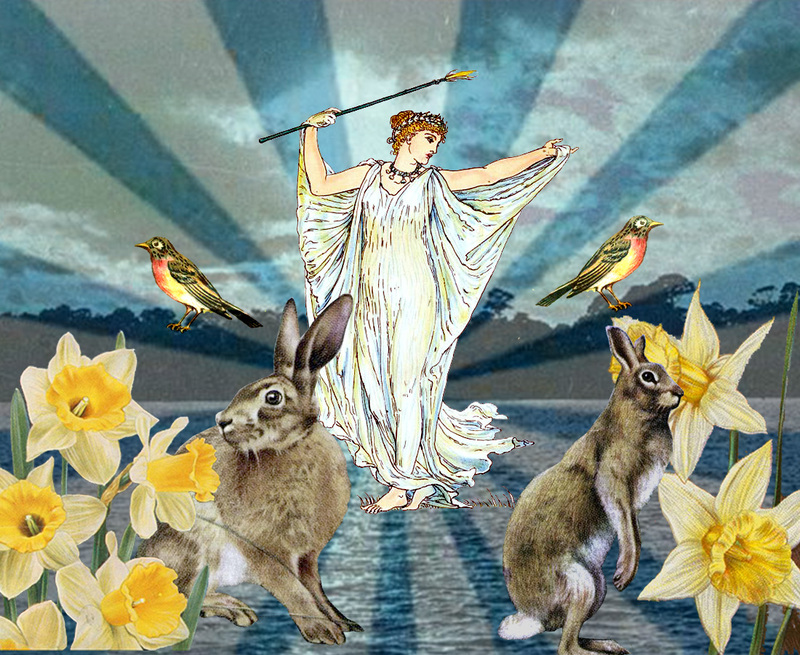 The Goddess of the spring and the dawn was named Ēostre or Ostara. The name first is recorded by an Anglo-Saxon monk, but even Jacob Grimm, of the Grimm brothers, wrote about Ostara and how undoubtedly, the traditions of Easter come from her. In Finnish folklore, the Goddess of dawn rides on light carried by hares, or rabbits, and there has long been history of rabbits and eggs tied with these Germanic traditions. It isn’t just the etymology of the seasons that varies, but also the symbolism. Here in the North America, we welcome the perennial flowers: dandelions, crocuses, and snowdrops to signal the warmer weather is coming. We also have the migration of the robin, a red breasted bird that bounces around everyone’s muddy yards in spring to dig up worms. As a child, a fallen robin’s egg was not an uncommon occurrence in the spring. We share a wonderful spring tradition with Japan: the blooming of the Cherry Blossoms. After Commodore Matthew Perry established opening trade with Japan in 1853, many cultural exchanges across the world took place with Japan. Aside from textiles, pottery, World Fairs, language, and religion, plants and flowers were shared with many countries. The sight of thousands of Cherry Blossoms blooming at once can now be seen all over the world. Thanks to the many Cherry Blossoms that were gifted to the United States over the years, I have seen this sight, and smelled it’s sweetness many times. There are thousands of Cherry Blossoms in Washington D.C., New York, New Jersey, and Philadelphia, each with their own histories of when and how many were given, and whom in Japan gave them. Another familiar sight I saw growing up was the robins. While I was teaching spring symbols to an ESL class in Philadelphia, a student was excited to tell me that Vietnam also has a “robin”. A type of migratory bird that is black and white, and arrives every spring. After an extensive search to find the name of this bird, I’m at a loss. If anyone knows the name of this bird, please write me. It appears that many species of birds in Vietnam have gone extinct over the years, with the loss of rain forests, and additionally the fact that many haven’t been well documented. There are so many spring traditions, festivals, and migrations across cultures and lores associated with many languages and people. Even places that don’t have seasonal changes have celebrations for the spring solstice, or other religious holidays. As the northern Earth tilts towards the sun, we will get our seasonal changes, we will experience it differently in each place. What is fascinating is how over thousands of years, there are so many traditions that have been born, developed, and been shared. The more I learn, we share more commonalities than differences, and I hope as our globalism allows us to interact with each other, and experience each other’s cultures, we realize just how alike we are, despite the very different places we come from, the languages we speak, or the beliefs we hold.